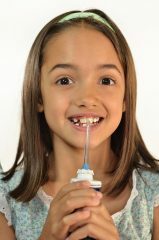 When you use a water pick, you’re not only dislodging any particles or debris and bacteria you might have missed when brushing, you are also gently massaging the gums, which helps promote blood flow in the gums and keeps them healthy. While water picks are an excellent addition to your daily fight against gingivitis and other periodontal diseases, they are incapable of fully removing plaque, which is why Dr. Diane Milberg and our team at Diane Milberg DDS want to remind you to keep brushing and flossing every day. Please give us a call at our San Diego, California office if you have any questions about water picks, or ask Dr. Diane Milberg during your next visit!